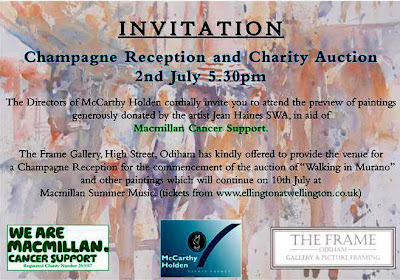 I support several charities and each year donate a painting to raise funds for the Macmillan Cancer Support .There is a wonderful summer event that takes place in Hampshire which I will share details of in another blog entry. This week before the event takes place McCarthy Holden of Odiham in Hamsphire are kindly sponsoring a champagne reception at " The Frame" a new gallery which regularly exhibits a collection of my work. I deliberately took time out to think about this years donation because I am so lucky in my life. I feel as though I am constantly walking surrounded by sunshine provided by the love of family,good friends and so many wonderful opportunities that keep coming my way. And I know I am very blessed. I never take a single day for granted because I am not aware of how many tomorrows will come my way. "Walking in Murano" is a painting full of sunshine and happiness. In the foreground a couple are enjoying time together, taking steps through a street in Murano, Venice. They may have been together for years and share wonderful memories of their lives that have been rich in moments to treasure. This painting means so much to me as it is in my first book " How to Paint Colour and Light in Watercolour" which will be launched next week at the Mall Galleries in London. I have many dreams coming true all at once. I had always wanted to see Venice and I have. I have always wanted to write a book.And I now have. And I wish with all my heart the word Cancer would disappear from this world and be a distant memory in the past. Forgotten completely, never causing concern,emotional distress or loss of a loved one. I feel helpless and yet I can help in a small way thanks to Mcmillan Cancer Support. You only have to look at their web site via this link to find out how you can help too. This week you can help me. This is a genuinely open invitation. If you would like to meet me, bid for " Walking in Murano" or win a painting of mine or show your support please come to "The Frame" in Odiham,Hampshire on 2nd July at 5.30p.m.. The main point of the event is that we are giving love,showing we care. "We couldn't provide our vital services without the people who support us............. Whatever you do, you'll make a real difference to people living with cancer"
Please be someone who makes a difference. This week will see the opening of the SWA Society for Women Artists Annual exhibition which will be opened by Princess Micheal Of Kent. The event will run from 30th June to 10th July and is a show to definitely not miss. It is hard to believe that not so long ago women found it difficult to exhibit, at times having to hide behind anonymous male names to have their work shown.The history of the SWA is well worth reading and a visit to this years event will certainly prove to be a showcase of some of the finest female artists work. I feel this is a huge privilege for me to be showing along side incredible artists and I know the time will pass very quickly until the show is over. I will be there from tomorrow, for the opening and on Thursday along with next week for my book launch. I have four paintings in the show. One I have been reluctant about parting with. In a beautiful frame this particular "Mans Best Friend" has hung in my home ever since starring in the " How to Paint Dogs in a Loose Style" feature I wrote for the SAA,Society for All Artists Paint magazine. I intended to keep him but something just nudged my decision to submit him along with a varied collection of work this year. Mainly so that I didn't become labelled as the artist who paints cockerels. 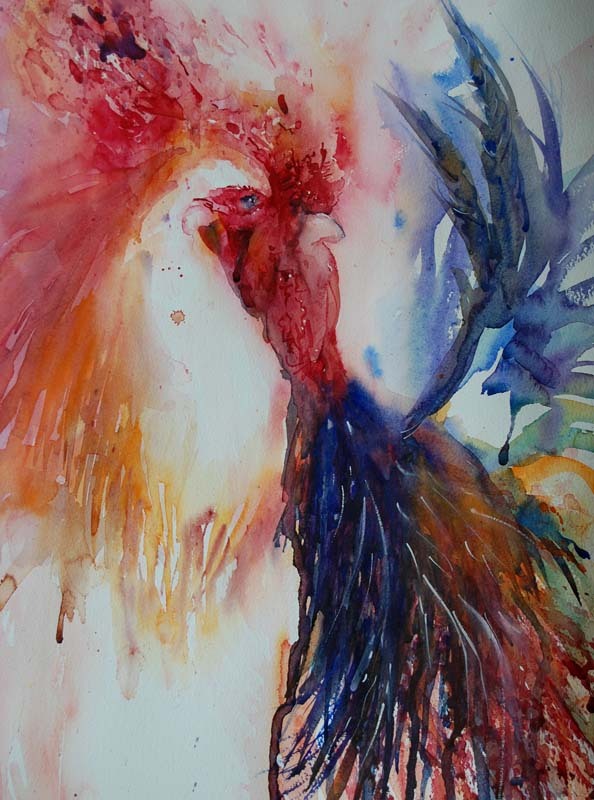 It was a risk after my winning the Anthony J Lester Art Critic Award last year for a body of colourful cockerel paintings that really shone in vibrant reds. But the decision happily was a successful one as I have been elected as a full member this year and I am delighted to be exhibiting again. A black subject painted with unusual colour combinations for added interest. 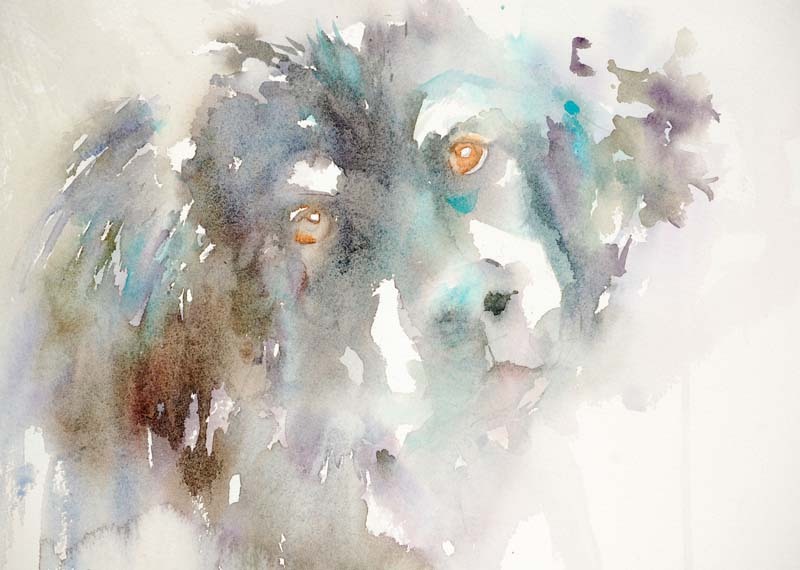 The strange thing is I was so excited to be asked to write the series but I couldn't find a black dog to paint to demonstrate how I see colour in black subjects. I went for a walk and literally bumped straight into this very handsome four legged star. I painted him softly at first. Enjoyed that stage but added darker tones later on. You can see this painting along with my other work at the SWA Annual Exhibition until 10th July. 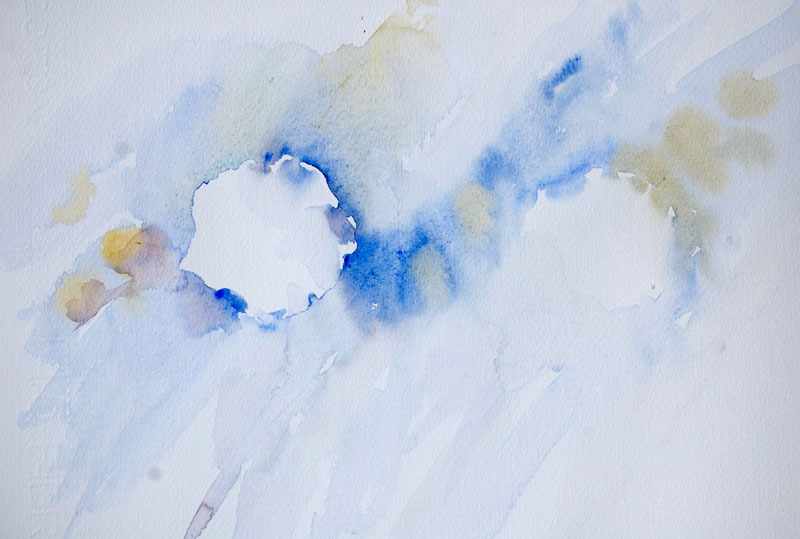 Here I am palying with primaries, Alizarin Crimson,Cobalt Blue and Cadmium Yellow. Because restricting my choices makes me work harder to explore the qualituies of each pigment. Years ago I used to always only work with three shades but recently I play with many glorious colours. Just for change I stepped back into yesterdays shoes and allowed myself only the three primaries I would have used ages ago. It is fun and attempting to achieve the effects I want with my hands slightly tied.The change has done me the world of good! 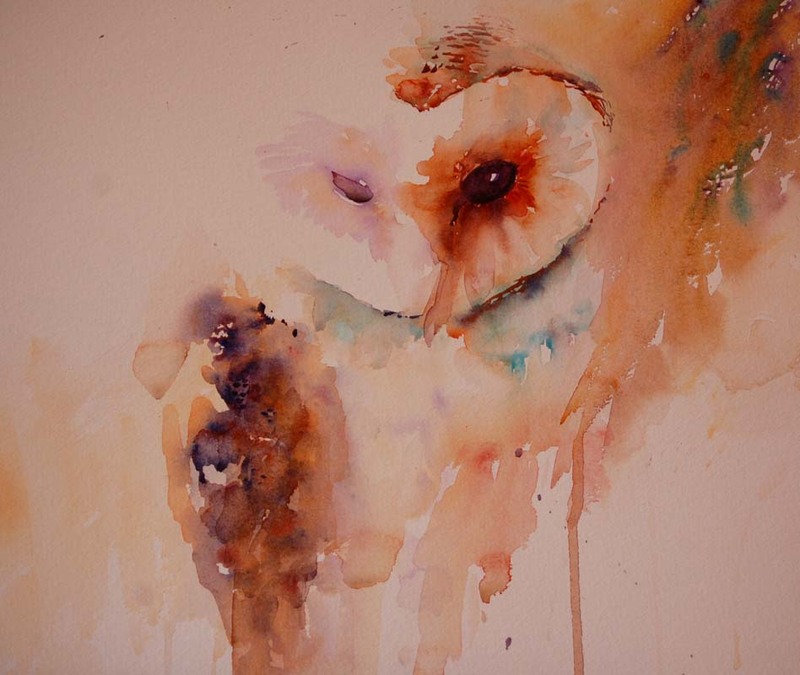 Bridget, a special thank you for the wonderful images of owl and hare that sit on my studio desk waiting for me to have some serious time to paint quietly! I absolutely love them, thank you SO much! Goodness how time is flying. I have had a wonderful guest from Hong Kong this week and behind the scenes I am working on an art article along with several charity events that all need information for press releases and catalogue information. There is so much to do but I knew time out in sunshine to recharge my batteries would be a really good idea. Sometimes in life we put so much before what our heart yearns for and we often regret not doing just what we really wanted.Which in my case today was to paint. I am so glad I listened to my heart! 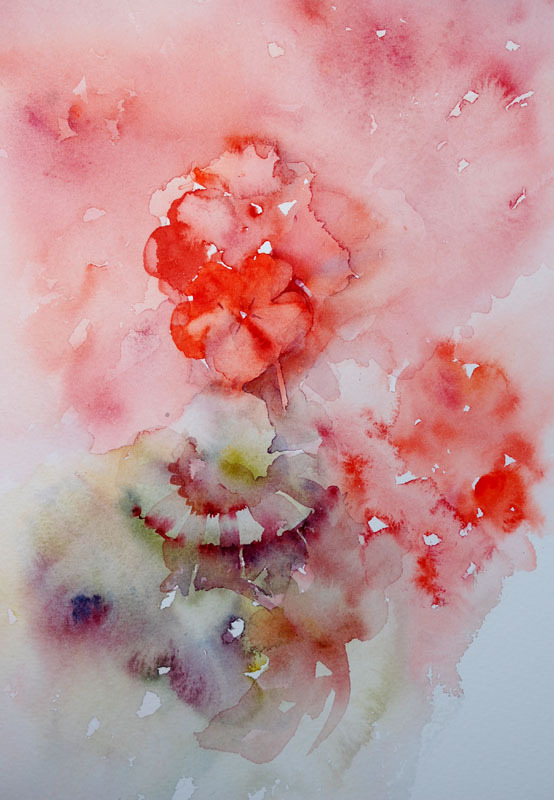 Colour flowed in my first study with patterns forming petals curling over in the heat. I loved the watermarks and fusions in this piece so much I stopped to enjoy it and then reached for a second piece of paper. Enjoying a first Stage, not racing to complete it but absorbing the beauty in its simple simplicty is a wonderful way to grow as an artist. 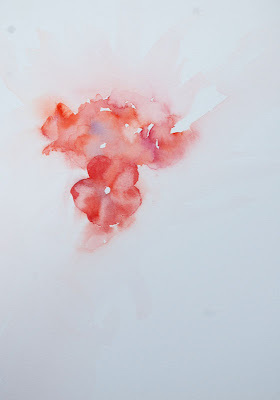 The sun shone so beautifully as I sat quietly capturing a second geranium in glowing colour. It is funny how our minds wander as we work. 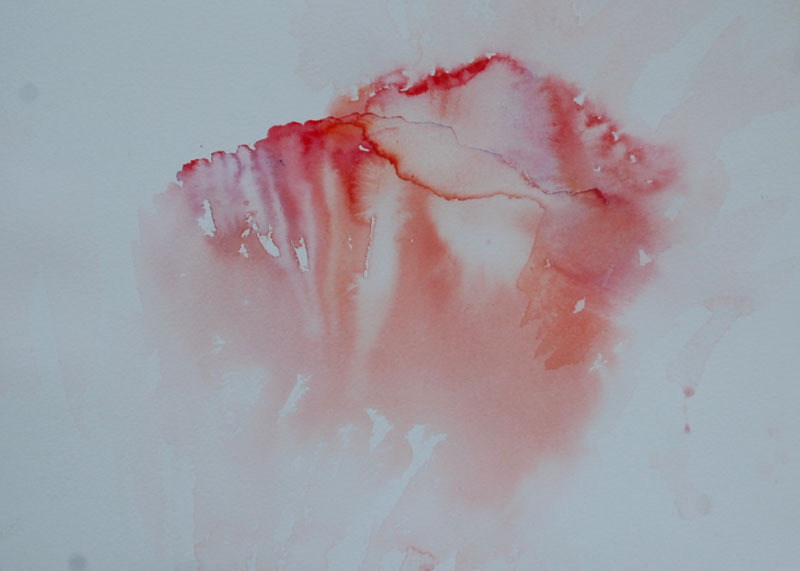 This afternoon I was painting brilliant juicy reds with touches of orange and my mind immediately flew to when I lived in France. The markets and homes there were so colourful with vibrant pots of geraniums dotted here and there.They always seem to add to the sunshine somehow. This time last year I was at a friends wedding in France and their home was absolutely surrounded by huge old pots of these charming red flowers which greeted you as you first saw their home come into view. I can see ghosts of geranium in the background here so I may continue with this piece or I may enjoy it as is. For now I am just really looking forward to picking up my brush again! 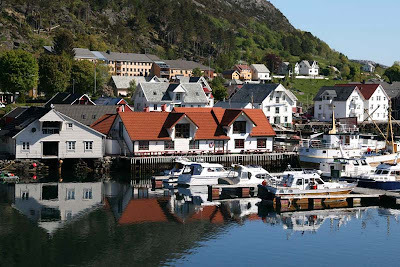 In August I will be arriving in Norway to hold watercolour workshops.These will be my first following the launch of my book" How to Paint Colour and Light in Watercolour" and I can't wait! 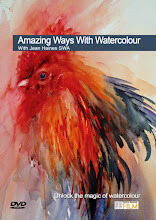 I will be covering subjects and techniques from my book along with a variety of new watercolour ideas and my goal is to leave you feeling inspired,motivated and addicted to painting in this magical medium.. There are only a few places still available. 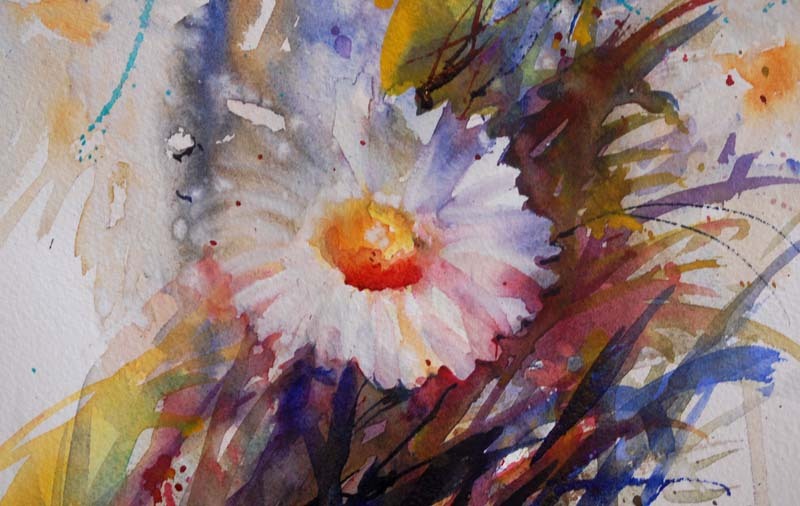 10th -13th August "Watercolours With Life"
15th -18th August "Watercolours With Life"
For everyone coming please bring your favourite watercolour materials with you. I can't wait to be there and really look forward to meeting you with my book! Almost alive, jumping off the paper and speaking to me. There are times when everyone needs the presence of a very special friend. A rock to lean on, someone familiar to watch over a shoulder saying everything will be fine. I have felt as though I have been living in a dream these last few weeks.With only weeks to go until the launch of my book at the Mall Galleries in London I find myself caught up in a whirlwind of events which include charity evenings,delivering work to galleries and working on press release information for several occasions coming up. This afternoon I am in my studio with several paintings that need to be completed for exhibitions but a "friend" was calling to me. I stopped what I was working on,followed my heart and decided to paint him. It seems he knows when the time is right for him to "appear" because this first wash of him seems so magically alive. I keep coming across the same question at demonstrations and workshops. How did you start selling professionally? Although the answer is too long for this blog entry my first subjects that became really popular were faces. 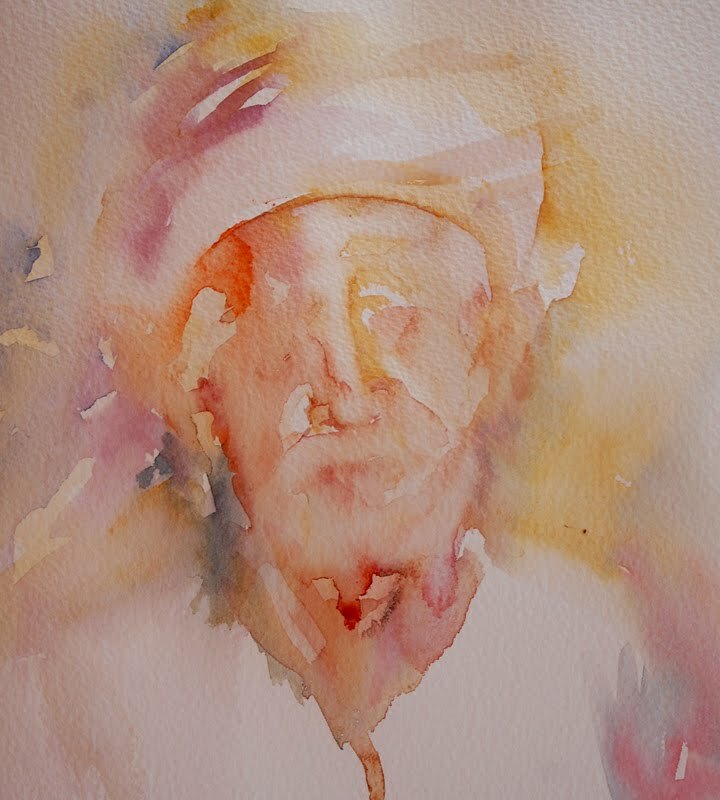 I had been told at the time that portraits rarely sold in galleries.But my passion for capturing the incredible faces that I saw in Dubai was so strong I continued to paint what I loved most. And they did sell. "Magic Faces" became collectable and I adored working on them. From first delicate washes of colour to the final hints of detail characters appeared on paper in an unusual and effective way. I still return to painting them in between other work. One is a favourite character which I normally fall upon for a break from my other commitments. But I have a new portrait of an old fisherman whose expression tells me he has had an interesting life far removed from my own. Probably a simple one, catching fish daily ,taking them to the market to be sold at a fair price and then spending time with his family. He probably has a million stories to tell of days gone by when things were so very different to today. I could probably tell a few stories myself of how I came to photograph such amazing people in incredible surroundings. This afternoon I lost myself completely in this face and thoroughly enjoyed the escape from reality where my life has become so full of activity from each day to the next. Quietly moving my brush I felt this old mans wisdom as he whispered to me. Labels: Portrait in Watercolour, Wise words. is not arrayed like one of these". Behind my cottage is a field full of daisies. This morning I wandered through the many heads of white touching a few as I passed, feeling their shape and delicate petals between my fingers. I couldn't help but think about the garden I am designing. How I choose where I put colour. How I worry about using too little or too much water to keep each plant healthy. And how I remove weeds to ensure the plants I so carefully chose can survive. And yet here is this field full of beauty growing completely naturally. I have watched the colours change and merge with the seasons randomly creating patterns. How we learn from nature. When I work in watercolour I see shapes of colour. I am aware that too much planning can ruin a wonderful result. Too little and the result may not be successful either. Patterns formed by random placement of colour can break up an otherwise orderly and almost boring composition. Too much water and we could dilute the pigment far too much.Too little and we could have easily moved to another medium where water isn't required. The " weeds" in a watercolour are the flaws or watermarks which others may see as a crisis whilst I see them as interesting features. Seeing beauty around us no matter how simple or complex is probably the very best lesson we all need to learn as artists.Seeing it, appreciating it and understanding what makes it so. 31st August 2010 "Watercolours With Life". 1st September 2010 "Watercolours With Life"
2nd September 2010 "Autumn Glory"
Whilst the above workshops are fully booked I may be opening one new session in October 2010. I will update my web site and add details soon. Painted During a recent Workshop Demonstration. After an exciting week of filming a DVD and then racing to an evenings charity event this week I am now back in my studio and deciding what pieces to work on. I have owls, flowers galore, racing scenes and cockerels waiting to be completed. And what would you expect me to choose? Absolutely none of them as I am working on a harbour scene which even to me is a complete suprise! I love the free way I work. To have to paint a definite subject and deny my heart the freedom to work at will would be like keeping a bird in a cage. Losing the will to sing being unable to fly. "Paint whatever calls to your artists soul" is a favourite saying of mine. And I follow it closely. This owl is looking so beautiful just as he is.The softness and position of the face is so thought provoking.Have they seen prey or are they just resting? I am in no haste to complete this painting,each stage is one to treasure as the journey itself in creating is so rewarding. On that note I need to get back to my brushes! Building up a painting using my technique with no preliminary sketch,taking small steps at a time and working towards a goal is very much the way I live. From my childhood I have always adored working with colour and known from a young age my heart is that of an artist. Having met so many inspirational people on my travels whilst living in UK and abroad I have been privileged to study with masters of all nationalities I may otherwise have not met. When I opened a demonstration recently with the comment " I still feel very much like a beginner" I was met with stunned surprise but I do. Maybe sharing this feeling will help others to understand we are all, every one of us on a journey. The only difference is where we are on the road. Some may have started long before us so be more advanced. Others may have started at the same time but due to circumstances be further ahead of us whilst some may be a distance behind. Some may not even know where they are headed until they get there.Others may have a goal, a dream to realise. We may not always have control over how fast we travel but we do have power over our enthusiasm and enjoyment of each step taken on our individual journey. 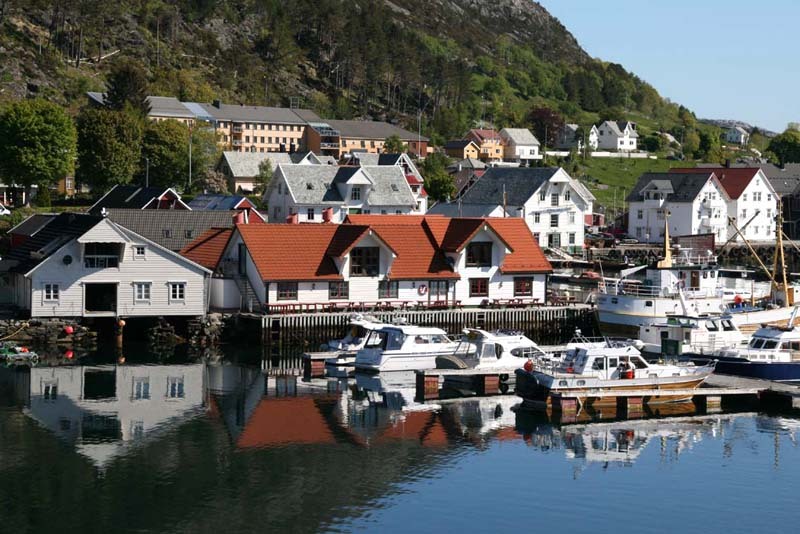 Getting anywhere can be a race where we miss all the beautiful sights along the way . Or we can choose to absorb all there is around us. I am enjoying each step daily which at the moment feels as though I am running at full speed.But I do believe life is not a rehearsal and this day will never come again. I am going to enjoy it and paint it beautiful! 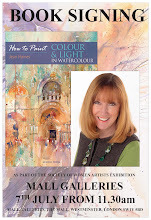 It is only weeks to go until my book launch at the Mall Galleries. Considering time seemed to be passing so slowly at one point until my book was to be launched I cannot believe how fast it now seems to be flying by! In a way I am enjoying these last few days when only I and the publishing team know the contents of my book. It is like waiting for Christmas but dreading when all the presents have been opened and the occasion over with . On the other hand also it is going to be so wonderful to finally be able to discuss the paintings that are in the book and why! This really is so very exciting! Please join me at the Mall Galleries on 7th July if you can make it to be there. And if you are please say Hello! Sold in aid of the Lady Taverners at Brasserie Blanc, London. This week has been incredible and I am finding it hard to fit in time to be online at the moment. I started the week by driving to film my DVD which I will share details about in another blog entry. I returned home so that I could leave in time to deliver the above painting to Brasserie Blanc for an evening hosted by the well known and wonderful personality,Raymond Blanc in aid of the Lady Taverners. 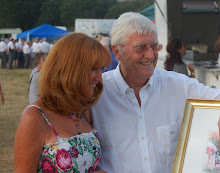 My watercolour was one of the main auction prizes and it was a wonderful occasion with many terrific people at the event. Watchinga film during the event which showed children that the Lady Taverners support was the most touching moment of the night. Without a doubt hearts were touched and we all watched whilst deep in thought. We often take for granted how fortunate we or our families are.These very special children are always seen to be smiling,laughing and enjoying life to the full. Maybe we should be asking them for help. Help in seeing all the good life has to offer no matter what we think our difficulties may be. I am proud to be a Lady Taverner and grateful for the opportunity to allow my love somewhere to go via a brush. Sharing, giving and knowing you really are making a difference makes life so worthwhile. SWA,Society of Women Artists Annual 2010 Exhibition. I leave today to drive for the filming of my DVD which takes place tomorrow . I have had the screen test and since then been in touch regarding products I use for the demonstrations and discussed which subjects I will be painting . Am I nervous? Surprisingly no! And this worries me. I am always nervous before a new experience but the team were so wonderful for the screen test that I am actually looking forward to returning and being with them again. This to me is the secret behind any new project. Knowing and trusting who you have agreed to work with. My publishers are fantastic and have guided me brilliantly along every step of the way. I feel creating the DVD will be exactly the same. And I have asked myself why I am making it. Is this for me? No it isn't because if it was I would have said "No" immediately. I don't enjoy being in front of a camera and that is a well known fact among my friends and colleagues. I made a decsion to agree to a DVD because of wonderful messages I have recieved asking me to make one for so long. I have so many amazing supporters who want this DVD who cannot get to my workshops. I read incredible messages explaining how much artists of all levels would like to watch me paint but to travel or get to UK where I am mostly is out of the question. 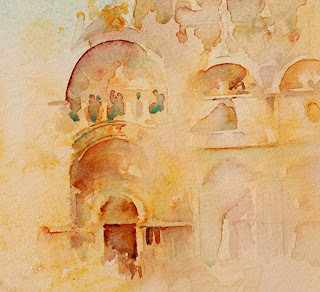 So today I am packing and preparing to drive a very long way, stay over and film in a way I hope that will inspire everyone to try painting without the use of a preliminary sketch, with lovely free flowing juicy colours and in a way that they are happy when they are moving their brushes. I want everyone who watches this DVD to feel the excitement and passion I feel from holding a brush. Wish me luck because this is a new experience for me and I really want to please YOU! I adore this time of year. Walking my dogs through the country lanes is so incredible when the hedgerows are beautifully covered with small delicate wild roses. 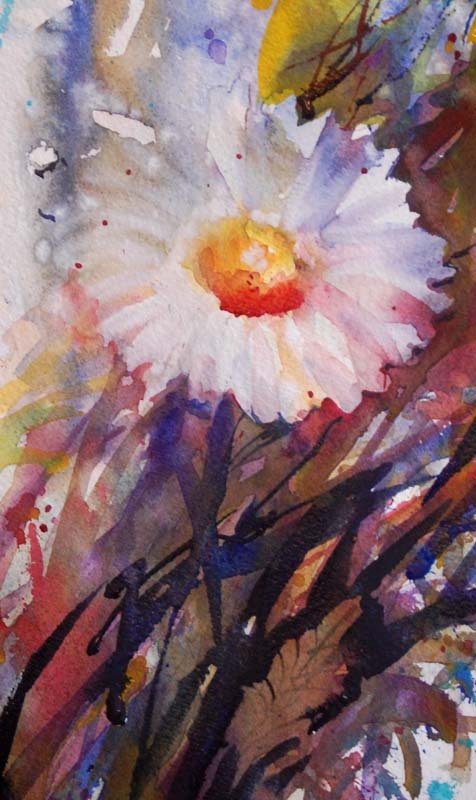 Yesterday I picked one small flower from a bank in our garden and painted it immediately. I know from experience that if I wait until tomorrow the petals will drop and the shape will be lost. I sat quietly diluting Alizarin Crimson to form the petals and worked away into the backgrounds of blues and greens. 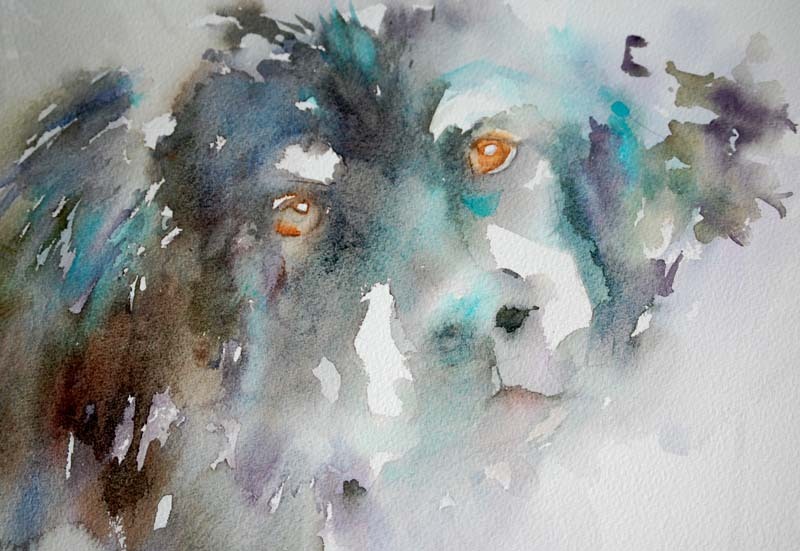 It did occur to me that painting something that catches your eye, pulls at your artists soul and begs you to paint it the minute that feeling arises really must aid the results. This small flower simply flowed onto the paper because I was so in love with it and wanted it to. Tip: Try painting something that really excites you and see what happens to your results! 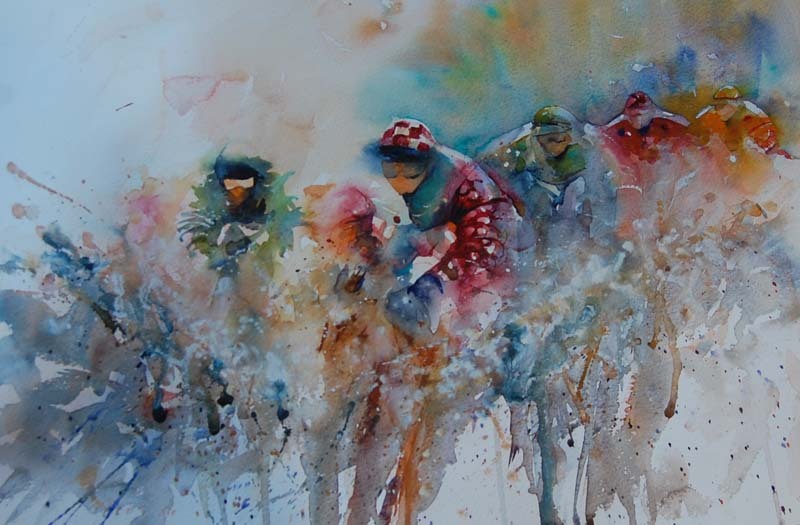 While opening emails and messages this week it was wonderful to hear that my painting " Taking the Lead" was in a promotion for the SWA, Society for Woment Artists Annual 2010 Exhibition. I look forward to seeing and meeting as many friends old and new at my book launch during the event on July 7th where I will be demonstrating at the Mall Galleries and signing copies of my book throughout the day. It will be a superb exhibition full of outstanding art and is definitely one not to be missed. Heavily scented flowers painted from my garden. Recently I have been so busy it has been almost impossible to find the time to add to my blog so this morning I will catch up. So much is happening and I am having to make priority decisions on what is and what isn't important so that I have less to juggle. Over the last twelve months especially my life has been changing where my routine has seen me regularly visit galleries, write, paint, hold workshops, attend exhibitions and meetings. My diary is now so full that I have had to sadly stand down from one art commitee. I do believe the word "commitee" stands for being committed to the role following through on actions that need to be taken. I respect everyone who volunteers their time this way because without dedicated teams on board this wonderful way of sharing and recognising talent would not be accessible to many. Having agreed to write a secondbook I know I will be now putting my energy into this new wonderful project which will mean little time to donate elsewhere. Having said that I am still on another commitee and very involved along with charity work which will always be top of my list of what I want to achieve. This week I will be in London at Brasserie Blanc for an evening hosted by Raymond Blanc where another of my cockerels will be auctioned in aid of the Lady Taverners. Knowing very special children will benefit from this event really is what makes moving a brush so worthwhile. But today I leave to film my DVD! How exciting is that! 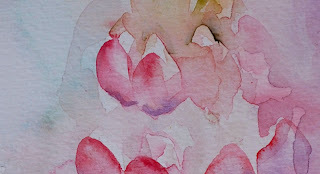 I quietly painted a few pinks from my cottage garden to relax and it was a perfect way to start the day. I feel "In the Pink"! With my book at last! What a week. Having decided I would wait until my birthday to open the package that arrived containing the advance copy of my book suddenly I realized this was not going to be so easy. I moved it away from my studio at one point so that I wouldn't be tempted to look but it was on my mind all the time. Friends were urging me to have two birthdays and open the package twice. 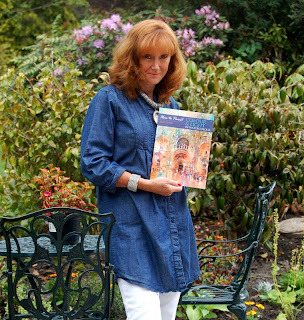 The anticipation grew until I recieved a call from my wonderful editorial director Roz Dace to discuss my next book. Roz knows me well and knew that I would probably squeal with delight when I saw the book for the very first time. She was right. I gingerly opened the envelope and looked at the cover. Here I couldn't take it in as I am finding it hard to come to terms with the fact my first book is seriously about to be launched. I only briefly looked inside at a few pages because I wanted to enjoy the occasion of opening the book fully with theone who has really helped me accomplish this dream. My husband. And so together the moment came when I could look at my first book, hold it as the real product that will be on sale soon and look back on an experience which has been a wonderful part of my life. Writing your first book is like painting your first painting. Then seeing your first truly successful painting for the first time in your very first exhibition. Others are going to see what you have created and they are going to judge what you have shared.You are nervous. This is a natural feeling. From the minute I signed the contract and agreed to write my first book until next month this journey has been one that has only been shared with my pubishing team who have guided me and encouraged me every step of the way. Only a small handful of people are aware of what is included in this publication and until now only the cover has been on view online. But in a few short weeks this will all change and my text and images will be there for all to see. It is a very strange feeling. 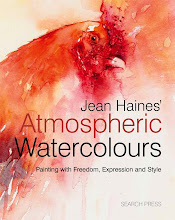 Knowing what you typed and painted in the privacy of your studio is now going to be hopefully enjoyed all over the world as like many books mine will be available online as well as in bookshops. I know friends and artists who have looked forward to this moment and I find myself feeling small and humble again in that so many artists have written so many superb books before me and I am just taking small steps to becoming a serious author. This is my introduction.. My first taste of what writing is like. I have a lot to learn. Inside the cover there are acknowledgements to everyone who has helped me in making this dream come true. Who have encouraged me to consider sharing my passion for watercolour by writing. I knew in January that this was going to be a very exciting year for me. I have no idea how I knew but the feeling was so strong. Maybe my Celtic intuition played a part. I left home at the beginning of the year for a meeting with my publisher as it was time to approve the colour images for my book before it went to print. At this meeting I met the team at head office and the seed of an idea arose for an exciting new project. Time has passed but in the background I have been quietly working on new techniques and subjects bringing them to life in a variety of unique ways. I am also receiving incredible feedback on my style with many requests to hold demonstrations all over the world. 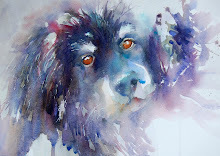 I feel very humble because I am only doing what I love which is painting and experimenting in watercolour. Last week just before I left for Alrseford Arts Society to demonstrate I heard some wonderful news which now I am really thrilled to share. I have been offered a contract for a second book which is really exciting! I am totally over the moon. Last night I spoke to my brilliant mentor Roz Dace at Search Press and discussed the year ahead. There is so much to take on when writing a book. This time I will have the experience of having written my first book. I also know I have a wonderful team of professionals behind me to ensure this new adventure will be one everyone enjoys. I am leaping into the world of being an author for a second time and loving every second. I will be sharing my journey on my blog from day one. A new adventure is just about to begin! 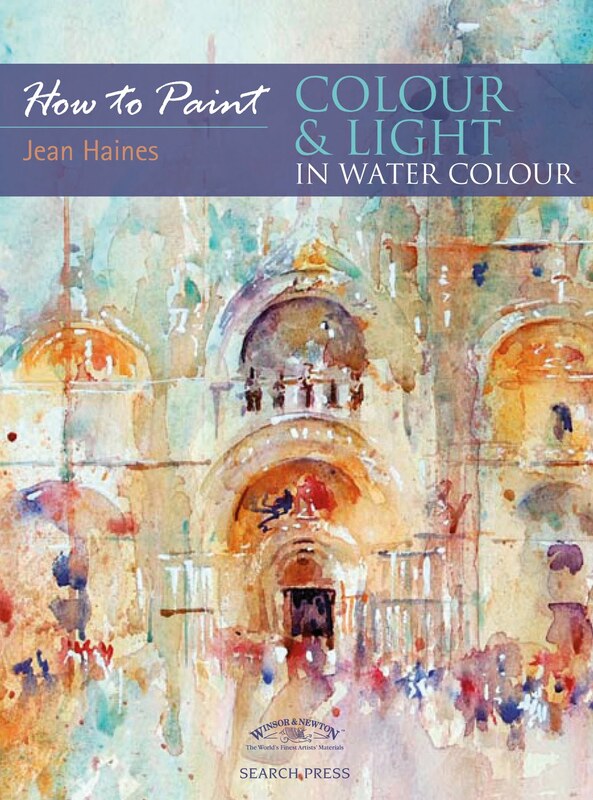 Please join me for the launch of my first book " How to Paint Colour and Light in Watercolour" at the Mall Galleries in London on 7th July 2010 at 11.30 a.m. I will be there all day and demonstrating also. 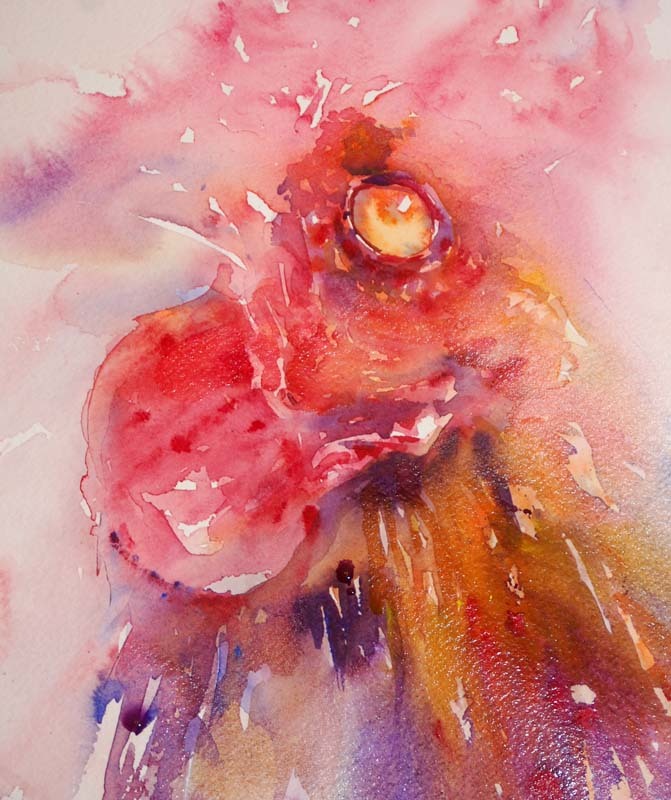 A fine cockerel gradually growing in washes and layers of vibrant colour. There is something far more interesting in painting subjects that aren't immediately seen as being beautiful. Last weeks " Animals Only " watercolour workshop saw me demonstrating a veriety of subjects looking at different sections and how to bring each to life in a unique way. Here I am progressing from a simple eye demonstration. I have looked at this subject from different angles and he works very well as a landscape or portrait composition. He is beginning to turn into a very exciting piece. All from a few simple brushstrokes! During my demonstrations last week there was often complete silence and I had to look to see if everyone was awake. There wasn't a sound in the room as subjects began to appear on white paper during each new demonstration. I describe how I work with each new brushstroke and these were being completely absorbed by everyone in the room. I started talking about the character of this cockerel and raised the question of wondering why he was so grumpy and in such a "fowl" mood. Comments such as " Maybe he's been on a hen night" or possibly been "hen pecked" gave rise to lovely laughter and the session really did turn into a wonderful day which flew by far too quickly. Putting that smile into a painting and a feeling of being relaxed while you work definitely aids results. Try it. Try laughing while you work or at least smiling and see what happens! A very grumpy cockerel is about to appear from an excitingly vibrant first wash. 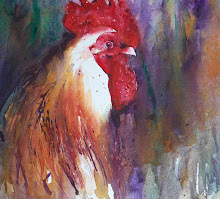 I have no idea why I seem to find myself laughing non stop when I paint a subject that looks grumpy! I am not alone as this wonderful cockerel in a very bad mood seemed to have everyone smiling last week on my "Animals Only" workshop. 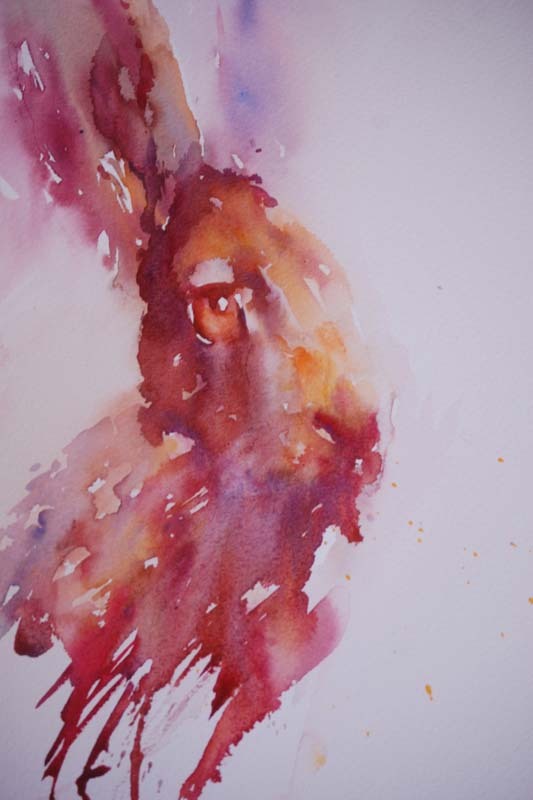 I did promise to share some of the studies on my blog so to everyone who was there "that beady eye" is now surrounded by beautifully glowing colour. I am delighted with how this is turning out! I was demonstrating how to paint a number of different eyes. I painted a lovely cats' eye, a dogs' and this cockerel purely because they looked as though they were in such a bad mood! Eyes say so much. It is important to try to capture personality by painting them full of life. Once the eye above appeared it seemed really alive. 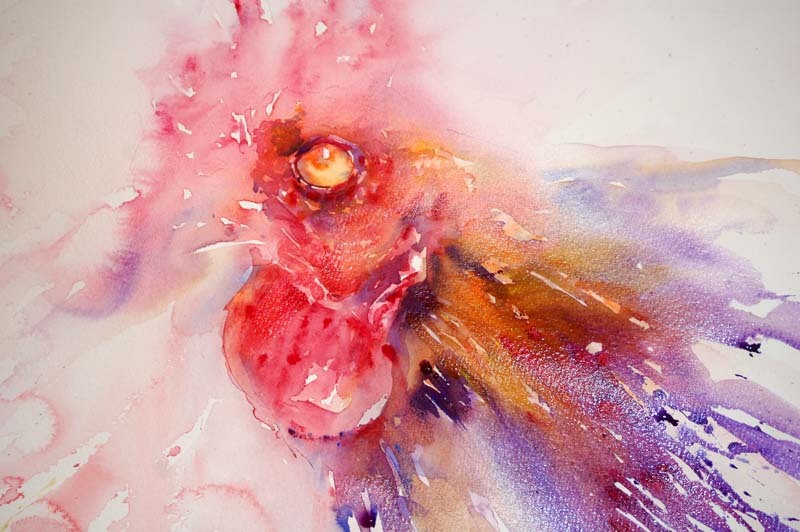 I have continued with some interesting brushmarks around the eye and then worked into the feathers. Fresh , clean colour. Confident brushmarks. A huge touch of enthusiasm and a relaxed hand will bring this fellow to life. He may look very mean but I think he is beautiful! Lupin Appearing in an Experimental Wash.
Having a cottage garden really is a huge asset to an artist especially this one! Each day I see wonderful shapes and vibrant colour that tempt me to pick up my brush. I am constantly feeling the thrilling urge to capture new subjects in completely different ways. As always light is the most important factor to me so when sunlight hit this particular plant I just had to play with an idea in my mind. I want to try to make the flower seem as though it is literally jumping off my paper at me singing with glorious highlights and a sense of being very delicate. 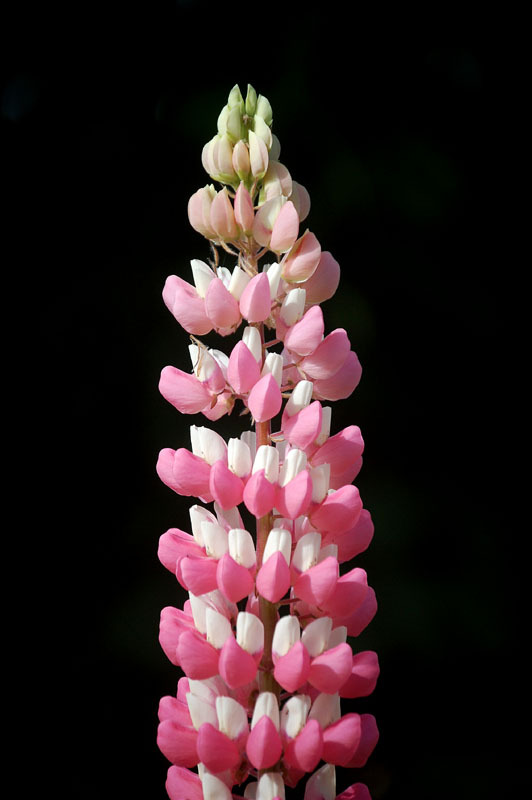 Lupins have a complex formation of tiny petals forming one tall bloom. In my workshops I often use the word "Simplify" so I find myself looking at how to do just that in each study of these beautiful flowers. 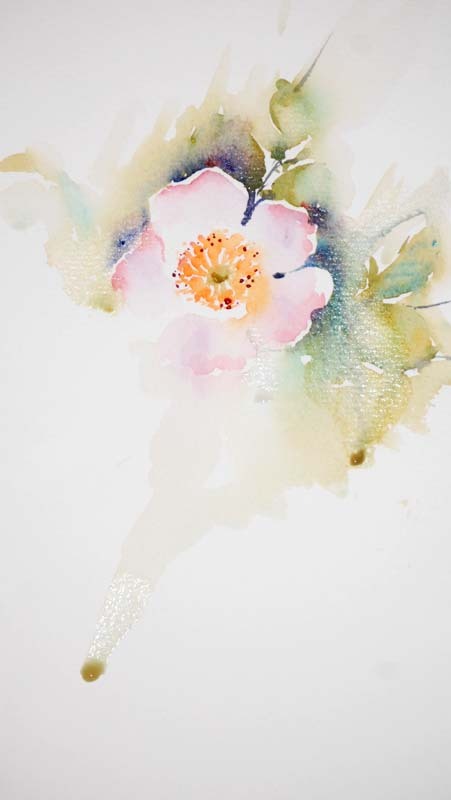 But there is a need to identify the complicated formation as the tiny individual petals tell a story which is so vital to the final composition. Starting at the top which really was in strong sunlight I used my W&N No. 10 sable brush and made marks for each tiny bud. Brush marks making each bud appear. A technique from my Shanghainese mentor of having the brush loaded with two pigments worked well here. Next I gradually worked down the flower stem adding individual petals. Lupin petals forming around the stem. 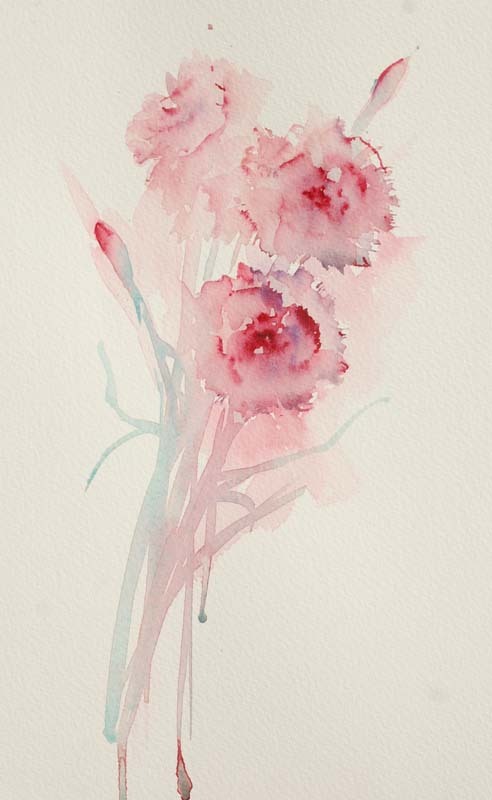 I have kept my colours very light and transparent in places to capture the feeling of a gentle flower that is soft to touch. 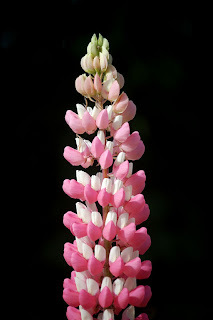 Finally here is one lupin from the flower bed. This image really does demonstrate how painting from a photograph is so different to painting from life. If you look at how flat the image looks to my painting which is full of light and life this becomes a very good example of why working from real subjects is so much more effective. Note the dark background and how it kills the subject. In reality this flower stood among many others which is the reason I have used pinks for my own composition to enhance my focal point in the foreground. Tip: An artist once suggested trying to guess which artists paint from life and those who always paint from photographs when walking around an exhibition. Doing so has taught me so much about my own journey in watercolour. I prefer to paint from life! If you have time I suggest finding one flower today and a few minutes to capture it on paper or simply just enjoy it by studying its form, seeing how each petal interacts with the others and while doing so close your mind to any worries of the day. Let go, relax and smile. Sunlight shining through the upper petals and ripples in the beautiful petals create interest in this first stage. Looking back this week has been full of wonderful moments. Holding workshops in Hampshire to demonstrating for a wonderful art society. Meeting incredible people. Recieving brilliant news of an exciting new project and most thrilling of all recieving a brown package from my publishers. In it is the advance copy of my book. It is here, the real thing. And you would imagine I tore it open eagerly to look inside to see the result of all the paintings and text I have so caringly put together. The strange thing is this package is still sat on my desk. Seriously! I have been looking forward to this moment for so long but I feel the same sensation of when my cover was to be on view for the first time. At that time all of a sudden a peculiar feeling of not wanting anyone else to see the cover set in which was completely unexpected. 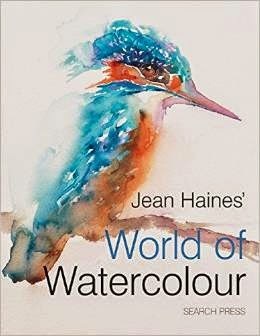 I have dreamt of writing a book to share my passion for watercolour for such a long time. I knew I wasn't ready to write until now. And to be honest in my soul there is already a second book full of exciting new ideas and techniques. However my first book has taught me how to paint. I thought I knew what I was doing until now. But putting into words why I work in my style has really opened my eyes. I have studied why I choose colour combinations and why each brushstroke matters. I have enjoyed how water and pigment create patterns. Always. But now I understand more clearly why every single detail is so important to my results. It is as though someone has turned a magic switch on and I just can't paint enough or find as much time to capture all I feel . I see colour and light so clearly now. So much so that painting it has become an addiction. I want all of my watercolours to literally sing with life as beautiful explosions of colour transformed by light. 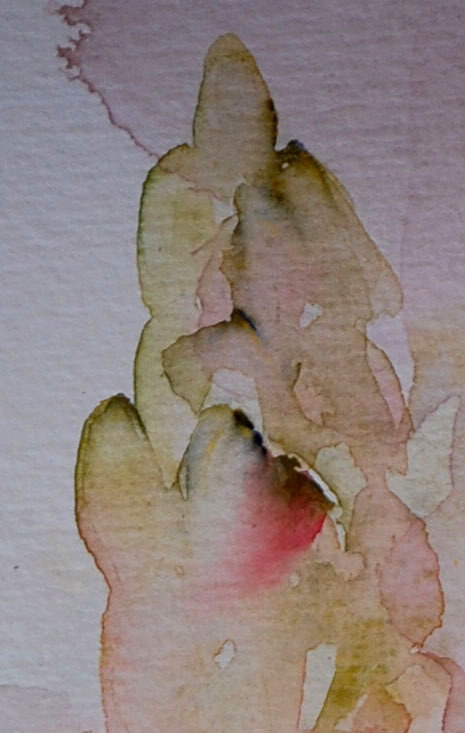 I sat in my garden this afternoon and gently played with pigment and water to capture a poppy from my cottage garden. Photographs of the flower can be found on my cottage blog. I listened to birdsong and became fascinated at how the light shone through the upper petals making them appear to be transparent. I took a photo of my first stage and a memory flooded back of this time last year. Then I had decided to include a poppy in my book. And that too is an explosion of colour and watermarks. A year on I have grown so much. Light is even more important to me now and how it effects everything I paint. In a few days time it will be my birthday and only then will I open my package to see my book. This will be the most special of birthdays . I will wait patiently looking forward to celebrating the magic of holding the first copy in my hands for the very first time as my dream comes true. 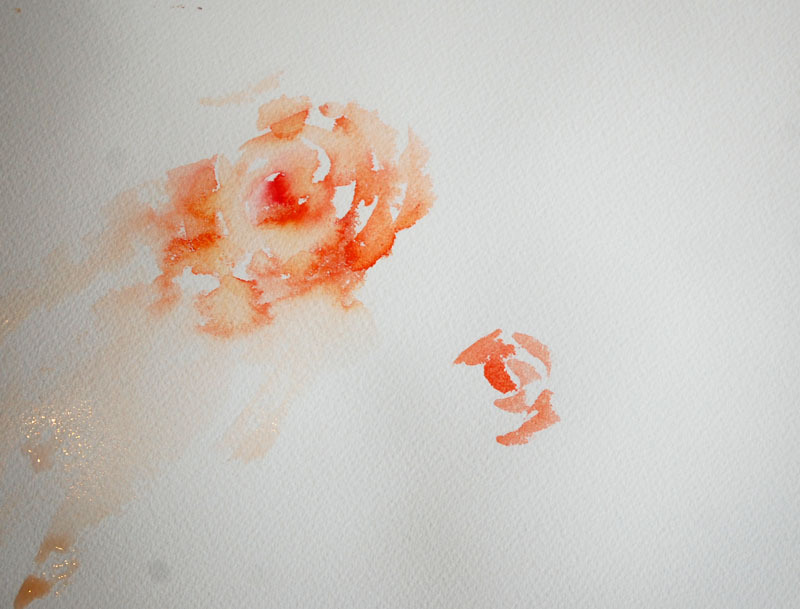 Until then I have a feeling I will be painting a rather large collection of poppy paintings!
" 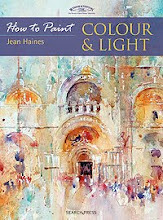 How to Paint Colour and Light in Watercolour" my first book will be launched at the Mall Galleries on 7th July during the S.W.A. 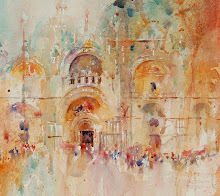 Society of Women Artists 2010 Annual Exhibition. Please join me to celebrate the occasion. Everyone is welcome. Each day so many wonderful sights greet me in my new home. Many are inspirational to paint, many are just simply beautiful. 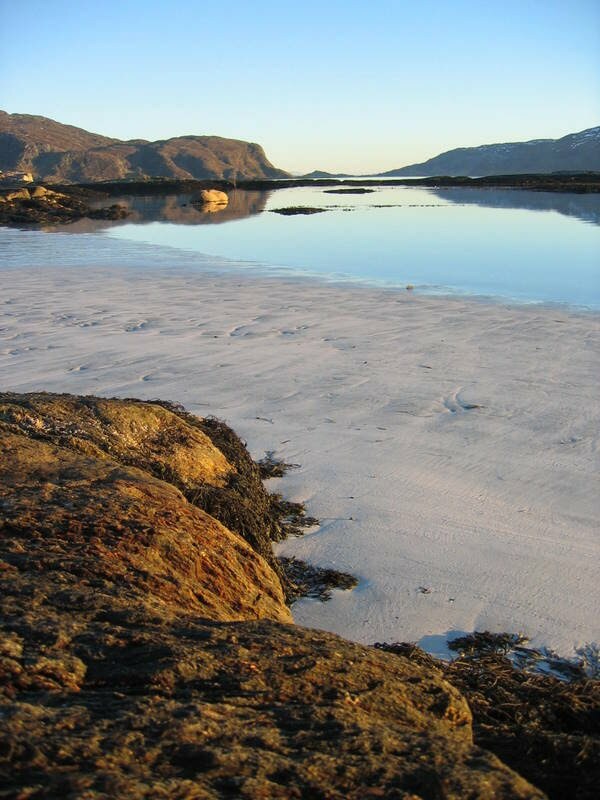 Far too beautiful not to share and so I have opened "Cottage Haven". A new blog where I will share images from the countryside and my garden from time to time. If you ever need somewhere to relax or simply find something to motivate your brushes please feel free to join me there. 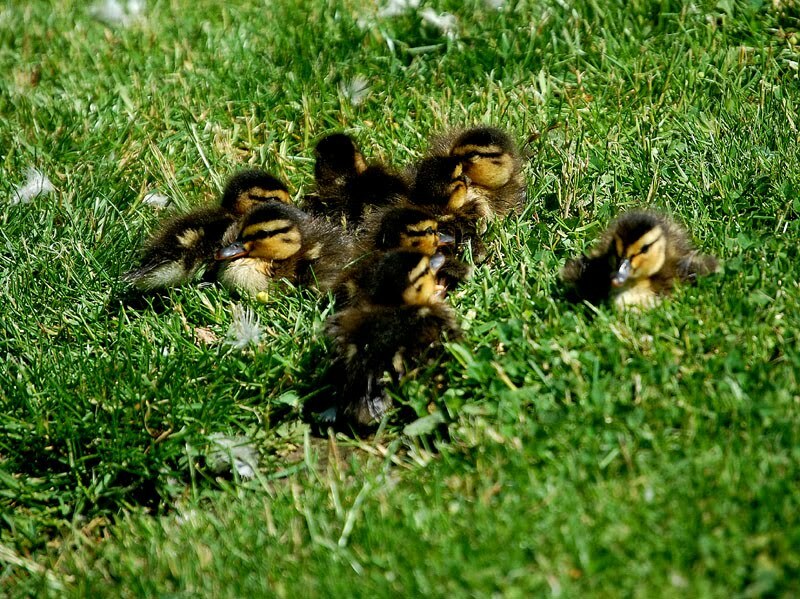 Our first duckling family sunbathing on our lawn. 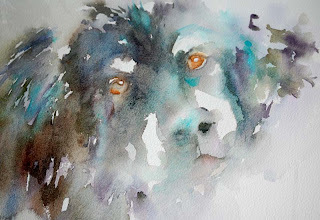 Having been invited as a guest artist I arrived in Alresford last night to demonstrate to the Alresford Art Society. I recieve many requests to give talks and demonstrations but sadly due to ever growing commitments quite often it is impossible to fit them all in. Fortunately dates and timings worked so that a while back I was able to agree to this occasion. I have walked into many rooms full of new faces in different locations so always have an open mind on what to expect. However I was really impressed with the professional arrangements at Alresford. being held in the local recreation centre with the meeting take place in a very large modern room. I was met by Sue Gentry who aided me in the arrangements for the evening which meant being fitted with a microphone and then working out where it would suit best for me to sit to be shown via camera on a large screen so that the members where ever they were seated could have a good view. Members started arriving and a warm atmosphere was immediately evident which is often the case in many societies where artists are eager to meet each other and share their news or experiences. The number attending was almost fifty as an audience so the screen really did make a difference for those sat at the back. 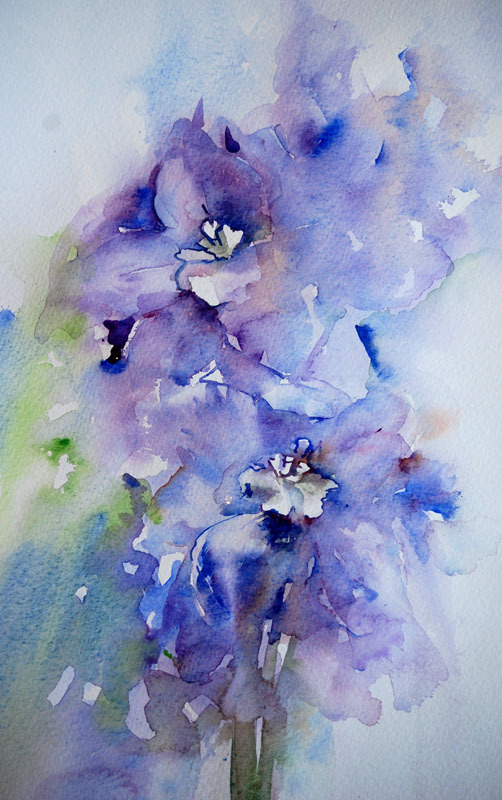 After the welcome and news introduction I started with a loose interpretation of delphiniums which very quickly covered a large piece of white paper. Often it is that first brush mark that terrifies an artist along with the thought of looking at a white piece of paper. Imagining ruining whatever you put on it so we looked at how to take the pressure off our shoulders immediately by deliberately painting for the bin which is now an expression permanently linked to my name! It is a wonderful feeling just relaxing allowing colour to simply run over paper without caring about the results. Try it! Next I moved to a complex racing scene starting from a tiny point and working away from the face of one rider. I answered questions as I worked regarding what paper I prefer to use, how I have evolved over time and do I feel I am still growing as an artist. The answer to this last question is yes, definitely ! On top of this I look back at last years work and see a huge improvement in my results now with the extra added excitement I know I will feel exactly the same next year when I look back to today. My style is fun because even I never know exactly what is going to happen next. Each time I pick up a brush I feel a heady sense of excitement and sheer joy as I watch colours merge and play with the water on paper. Sharing this joy is such a privilege. One I never take for granted. During the break I met several members individually and enjoyed the stunning view from the balcony which looks onto amazing countryside. To receive comments on how much my demonstration and method of working was enjoyed, found to be inspirational and motivational was such a terrific feeling. To hear one member tell me I had removed the fear of painting for them was a most magical highlight of the night. I left thinking about the society. How lucky they are to have such a terrific venue and such brilliant equipment. I also was really impressed with their organization and warmth not just to me but to each other. Friendship was obvious and a very keen sense of enthusiasm. 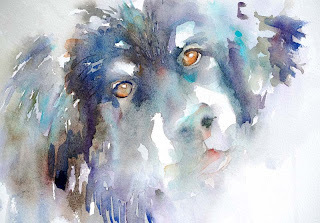 You can visit Arlesford Arts Society for their upcoming exhibition from 16th -18th July or if you live nearby I am certain they would welcome new members. Thank you so much to everyone who was at last nights demonstration, I loved meeting you and I really appreciate the invitation to be a guest artist for your society. I hope you will be painting up a storm following last nights session! 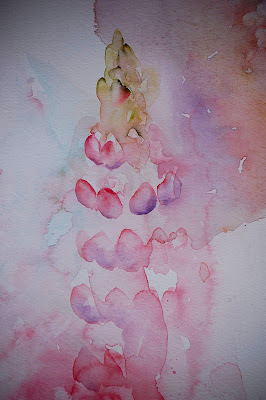 First Wash of beautiful Hollyhocks from Monets' garden in Giverny, France. This has been an incredible week full of magic and many memorable moments. I held two watercolour workshops. One was "Watercolours With Life" covering my technique and the second was "Animals Only" which is definitely going to be repeated in the future. On both sessions as always I met the most wonderful people and I know I am so lucky to do so. On the first workshop a lovely lady called Anna thoroughly enjoyed the day and achieved so much in a short space of time. 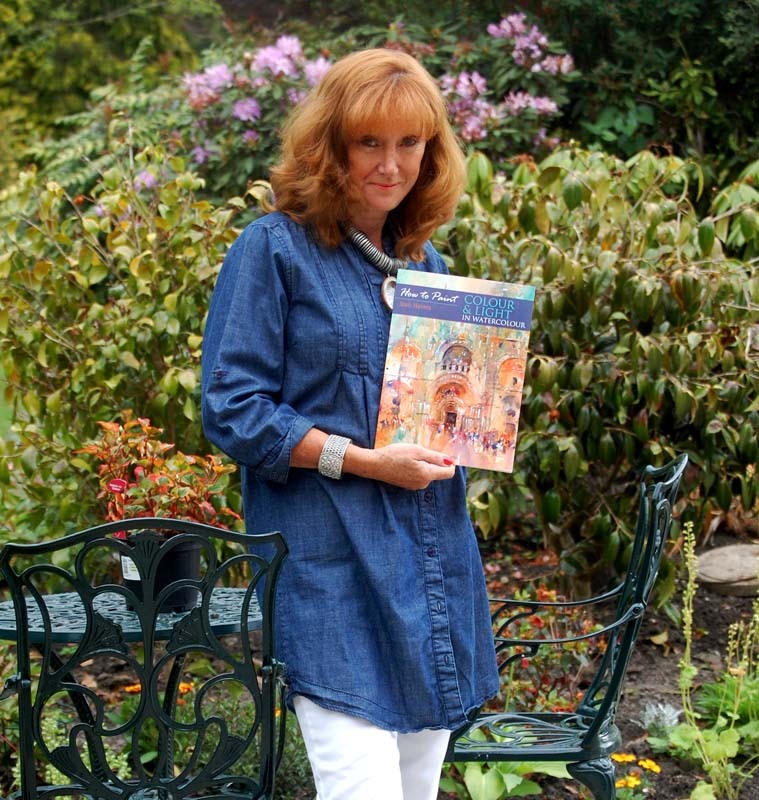 What fascinates me most is that someone like Anna will come to one of my workshops after painting in very tight detail for years, discover a new approach to painting, let go and absolutely enjoy themselves creating the most magical of results. I often sit and work by demonstrating one on one in the later part of the day creating individual studies on various subjects chosen by each artist in the group. This is a personal way of giving my time and guidance plus tips. When I came to sit by Anna I was delighted to see she had chosen a favourite image of mine. I visited Monets' garden in Giverny a while ago now and took so many photographs as memories to always keep my spirit in that amazingly inspirational place. Each time I pick up a brush with one of these images I feel a sense of wonder. Anna must have felt the same as she started to work because her first wash was gorgeous. But it was losing something in her translation. This particular flower had started growing sideways rather than upright as you would expect from a hollyhock. Anyone who knows me well will be familiar with my art terms and vocabulary which you will discover in my book. I have my own words to describe how I work and see things. 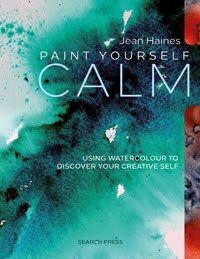 I call quiet washes "whispers" and louder washes or detail "shouts". They work perfectly to my style and I know artists who know me smile when they hear me say them. Anna had captured the idea of a "whisper" perfectly but was lost on how to "shout". I sat quietly next to Anna and painted the above first wash to demonstrate that quiet sections in any painting work well when they are combined with a few more exciting and bolder sections. Deep blue fading to pale became very beautiful and this also enhanced the white of the petals. The pair of us became enthralled with what was happening on my paper. Anna then followed my demonstration and I am thrilled with the outcome, a gorgeous creation of soft colour enhanced by darker gentle "shouts"! 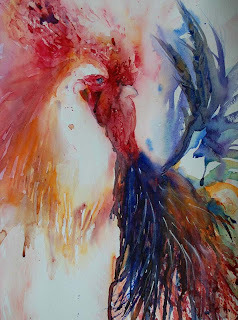 As always I have left my own workshops very eager to paint quietly and that is what I intend to do next! Today I am holding my "Animals Only" workshop and I am so looking forward to it. We will be looking at techniques for painting eyes that shine with life, noses that are so realistic you wish to touch them and ways to make fur and skin seem really creatively fascinating. All of course in pure watercolour. The venue is all ready and the workshop has been fully booked for some time now as a favourite session. It is one of those days when I want to sit in the class as well as teach it because I adore this subject so much. I wonder if there will ever be a day when I don't feel this rush of enthusiasm about picking up a brush and this heady excitment of knowing you are going to give everyone around you a great day? Instinctively I know this will be one of my favourite ever sessions and most memorable. Not because of what I demonstrate or paint but from what everyone who comes to me paints too because their enthusiasm is as strong as mine.
" 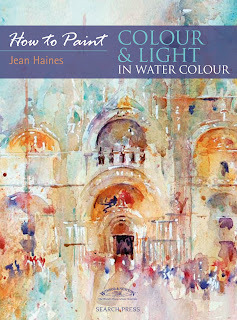 How To Paint Colour and Light in Watercolour " my first book will be launched at the Mall Galleries, London, U.K. on 7th July 2010 where I will be demonstrating during the SWA Society for Women Artists Annual Exhibition. I will be signing copies which will be available at the gallery to purchase. Everyone is welcome on this very special day! "First Wash of a Rose in Watercolour"
I was thrilled yesterday in my workshop to see " homework" of roses painted from my blog post a little while ago. I had shared how I paint roses and shown my technique in a blog entry suggesting anyone interested could practise my style. 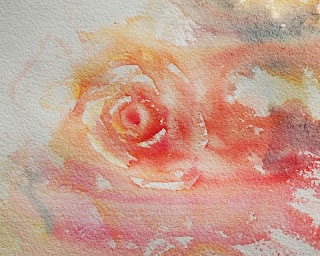 Yesterday on my "Watercolours With Life" June workshop in Hampshire I saw a fabulous collection of roses and this really does hit home how giving away ideas can bring so much joy to others who love watercolour also. I believe as artists we are so fortunate to have the gift of enjoying beauty and life so much that we wish to capture it in our chosen mediums. To lock ourselves away in our studios for hours on end and paint without sharing would be like being in a prison cell, one without bars! Sharing techniques makes the art world a far richer place and it also brings us in touch with some amazing people. When I have time I will set more " homework" and hope that is enjoyed too! I spent a wonderful day holding a "Watercolours With Life" Workshop yesterday and it was for me a memorable day in many ways. I am always thrilled to meet such wonderful people on these sessions. Bookings come via email normally so until the actual day of the workshop I haven't a clue who is going to be in the class. This time there were a few familiar names and some completely new to me. I thought driving three and half hours to make my DVD was a long way to go but one lady had driven for over six hours from Scotland to come to my session so when I make my next trip to film I will be thinking about that and how lucky I am the studio is so near! I did love the day which I will share in another post with new images. But for now I must mention how special it was to meet face to face those who I have only communicated with on my blog until now. I wonder if we all sit and type imagining that when we press the send button our words will disappear into cyberspace and not be read.To hear personally how a blog is enjoyed is such a unique experience. And it urges me to share even more. To everyone who came on the session yesterday it was fantastic to meet you and I truly hope you left feeling inspired and will be painting non stop now with amazing results. I certainly can't wait to pick up my brushes this morning!